A unique, miniature circus featuring hand-crafted, moving figures has been rescued from a field in South Devon. Silvers Model Circus took its creator David Hardie and his family nearly 50 years to make. 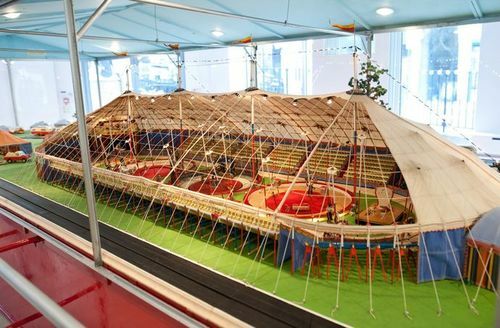 Hardie was apprenticed to his family’s tent-making business in Sydney, Australia, and started building the first part of the circus in 1931 when he was just 17. Later he moved to the UK and members of his family helped expand the circus. It was first exhibited in 1982 after which it toured the UK and in 1984 it formed the centrepiece of the Christmas display in Cheltenham and was officially opened by Earl Spencer, the father of Princess Diana. The entire model is powered by one motor and is operated by a complicated system of belts and pulleys connected to a single drive-shaft. Every item in the model has been made by hand and is exactly 1:24 scale. After David Hardie’s death in 2002, the model was stored in various locations until, finally, it ended up in a storage container on a piece of wasteland adjoining a riding stable. Last year, Lucy Townsend, Hardie’s grand-daughter began researching the model and discovered that it had been packed away in a storage container on a piece of wasteland adjoining a riding stable. “I persuaded my mother and uncle to take me to look at the model and see whether it was still in a condition that could be saved,” Lucy said. “When I first saw the container, my heart sank as it was half-buried by the dung heap from the stables but, eventually, we were able to reach the boxes containing the model. The family have decided that they would rather see the model go to a new home than return to its container so it is going to be auctioned in London by Roseberys on 22nd November. This press release was distributed by ResponseSource Press Release Wire on behalf of Inspired Toad Productions in the following categories: Men's Interest, Entertainment & Arts, Leisure & Hobbies, for more information visit https://pressreleasewire.responsesource.com/about.